In 1990, legendary rally Tony Pond became the first man to lap the Isle of Man TT course at over 100 mph in a car. The vehicle of choice for this 22 minute lap was a Rover 827 Vitesse. That record stood until Subaru USA teamed up with another Manx-based rally champion, Mark Higgins. In 2011, the record tumbled and the first sub-20 minute lap was registered. 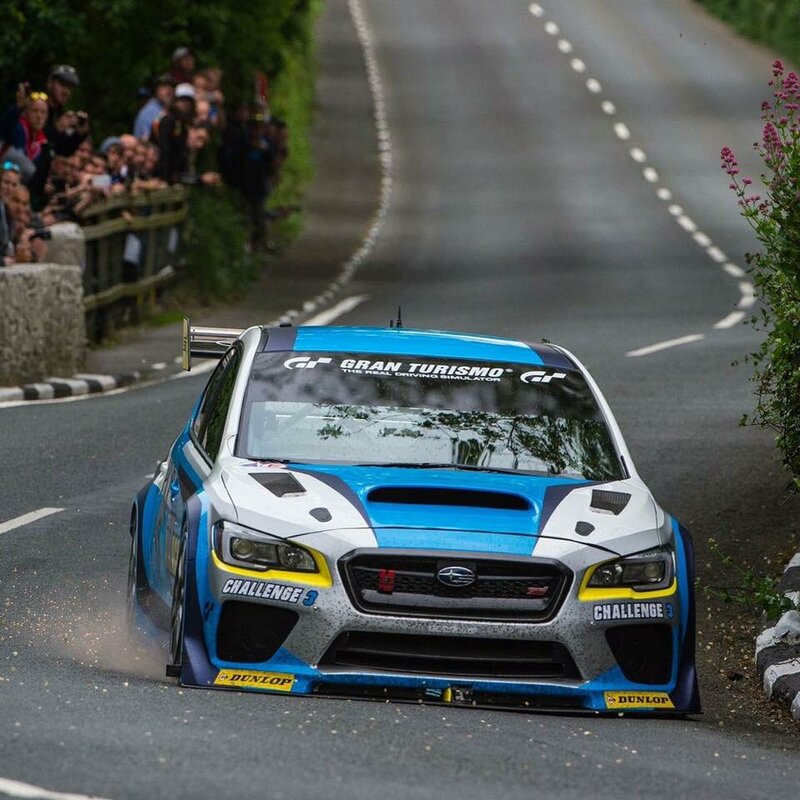 In 2014, Higgins smashed his own record in little more than a road going Impreza WRX STI. The only modifications were a roll cage, competition spec seats and uprated springs and dampers. And a louder exhaust so spectators and residents could hear him coming. 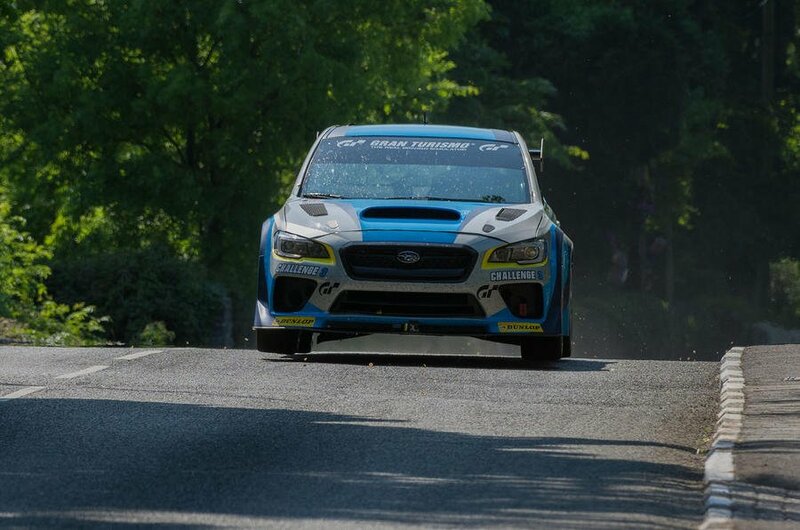 This year, Subaru USA decided to get serious and enlisted the help of race engineering experts Prodrive. Together, they created a 550bhp dedicated island racer. The engine is a 2 litre unit based around WRC technology. The drivetrain has ratios designed specifically for the full-on, flat-out nature of the Snaefell Mountain circuit. You can’t miss the massive carbon fibre rear wing. It’s also active, which means that Higgins can trigger a low drag mode on the long, high speed straights. On Saturday, Higgins blew his existing lap record to smithereens. He posted an incredible average speed of 126.971mph, setting a time of 17 minutes 49 seconds. In near perfect conditions yesterday (Tuesday), Higgins shaved a further 14 seconds from that he previous best lap. He covered the 37.73 miles in 17min 35.139sec, which equates to an average speed of 128.730mph around the 37.73-mile circuit. 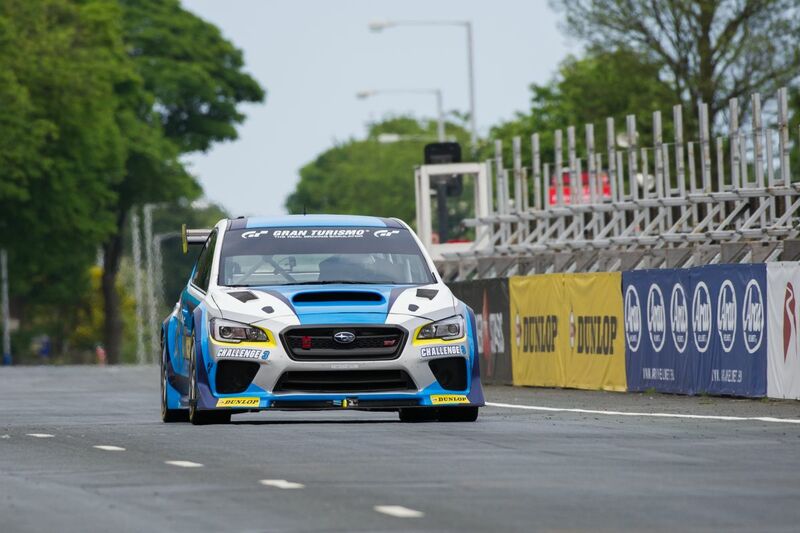 Subaru USA are reportedly pulling together video footage of the record attempt, which will be uploaded with a full in-car video of the hot lap. In the meantime, you can check out this video from Prodrive which gives a flavour of the sheer speed and astonishing talent of local hero Higgins. This very special WRX STI is set for a further outing on Friday. Pretty amazing that Miggins is on a pace similar to the SuperSport and Superstock bikes and its brilliant that someone has finally got a chance to have a go at it in a properly prepared car rather than his previous efforts. It would be interesting to see where he is quicker and where the bikes are quicker. Obviously on the big sweepers like the Veranda on the mountain the extra grip from 2 more wheels will help but the bikes must have an advantage at places like on the Sulby straight and through Ballagh where they can go kerb to kerb and the width of the car is a disadvantage. | Pretty amazing that Miggins is on a pace similar to the SuperSport and Superstock bikes and its brilliant that someone has finally got a chance to have a go at it in a properly prepared car rather than his previous efforts. It would be interesting to see where he is quicker and where the bikes are quicker. Obviously on the big sweepers like the Veranda on the mountain the extra grip from 2 more wheels will help but the bikes must have an advantage at places like on the Sulby straight and through Ballagh where they can go kerb to kerb and the width of the car is a disadvantage. I'd agree with this too, in fact I would think the car would be quicker on any corner, not just a fast one, but the time advantage is probably better on a fast corner, even with the bike's ability to take a better line, due to it's width. Not knowing much about the Subaru (or these kind of cars in general) surely a car would be able to out-brake a bike by a considerable distance? Also what kind of top speed would this car be capable of, or geared to do? Good article and as said its good to see what a well prepared car can do. Although its amazing to think a bike you can go and buy for less than 15k can potentially go faster than a race/specifically prepared car. Looking forward to seeing the video. I absolutely loved the previous one, found it great to watch. TT Zero bike doing 119mph average last year and probably break 120 later today at TT2016. Need to see how a Tesla or something would compare to that. A thing I have wondered. Would a two wheel drive car be quicker? Thoughts? Do they still do Mad Sundays? Yeah, Sunday last, I think. | Good article and as said its good to see what a well prepared car can do. Although its amazing to think a bike you can go and buy for less than 15k can potentially go faster than a race/specifically prepared car. I doubt any of the bikes racing there cost only £15k....and I know which one I'd rather crash with !